Equally at home on a ranch in Texas or a horse stud in Australia, the Ford short wheel base Texan is built for hard work. With high ground clearance, large 22 inch tyres (turf or road tyre options), the short wheel base Ford Texan Utility vehicle is a very capable vehicle at an airport, warehouse, farm, zoo, park, caravan park or golf course. The short wheel base Ford Texan Utility vehicle comes standard with a high torque shunt wound 48 volt electric motor, 22 inch Turf or 6 ply road tyres, heavy duty Trojan batteries, full perimeter steel chassis, reinforced steel nudge bar and an electrics pack that includes head lights, tail lights, Dash mounted USB jack, 12 volt dash mounted power outlet, and an onboard 48 volt to 12 volt reducer to allow fitting of 12 volt accessories. 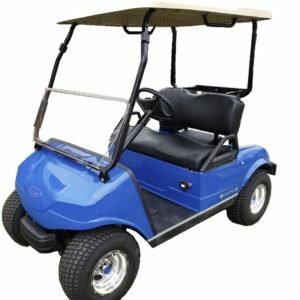 Options and upgrade model features include heavy duty tow bar, Lithium battery pack, 5kw AC motor, and 4-wheel hydraulic brakes. A safety glass windscreen with electric wiper washer, 2 or 3-point seat belts, ladder racks, amber beacon light tool boxes and custom cabinets are also available. For a complete list of models, options and accessories please contact us. Battery Trojan 8v T875, On-board Charger. USB Dashboard jack, 12V dashboard power outlet. Curtis Controller. Options Battery Watering System, Premium seats, 22 inch road Tyres, Tow Bar, Roll down weather enclosures.